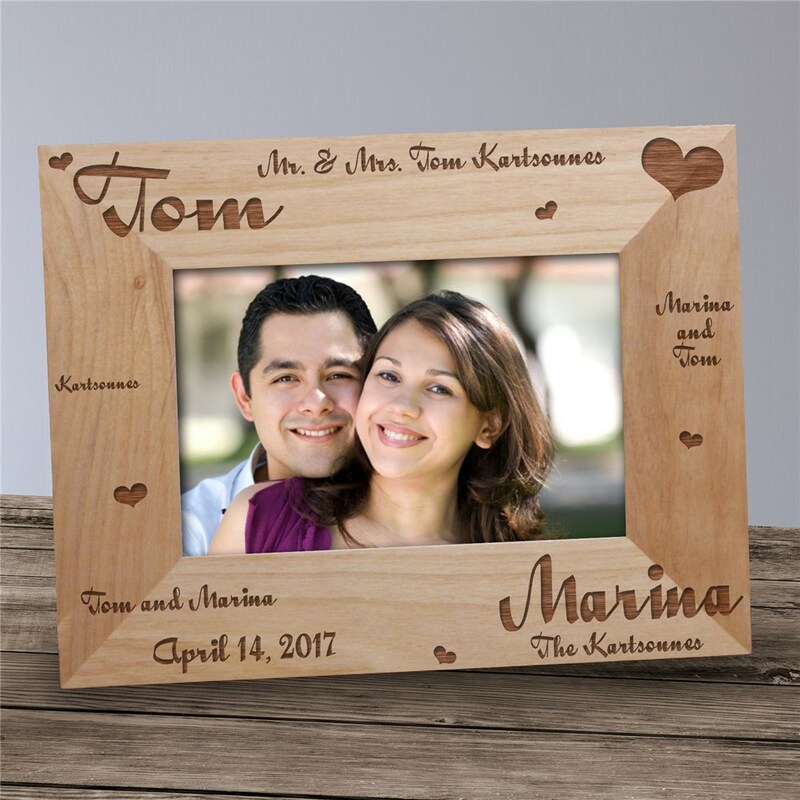 Always cherish that special day that you and your significant other got married with our Wedding Personalized Wood Picture Frames. This beautiful frame features the newlyweds names & the special wedding date. Give any newly married couple this classic Wedding Personalized Wooden Picture Frames that will they will be able to appreciate years to come.Our Personalized Mr. & Mrs Wedding Wood Picture Frame comes in three sizes, please choose from, 4”x6”, 5”x7”, and 8”x10”.. Easel back allows for desk display. Engraved personalization features the natural wood grain color. Wedding frame includes FREE Personalization! Personalized wedding frame includes any wedding or anniversary couples names and wedding or anniversary date. The personalized frame was great. I love it! I know the newly wed couple will. Recently ordered this frame for a wedding present. It arrived with a few issues. I spoke to customer service and sent them a picture of my concerns. A new frame at no charge was shipped within 5 days! A Personalized Wedding Picture Frame is the perfect gift to give to that special bride and groom for their wedding day. Also makes a unique gift for a bridal wedding shower. When your anniversary comes along and you need that special anniversary gift start here with our Personalized Mr. & Mrs. Wedding Picture Frame. Your sweetheart will love this gift & cherish it for years to come.